June is a month celebrated around the globe to rejoice and reflect on LGBTQ history. Next week is DC Pride, and we locals have a long history of celebrating this weekend in high style. The Capital Pride Alliance works hard year round with a coalition of area groups and volunteers to pull together an incredible celebration of LGBTQ diversity. Here are some of our highlights of where to eat and imbibe around our the venues for our picks of events to attend! Any drag queen knows it's all about the outfit! Don't wait until the last minute to reach into your costume trunk, only to come up with a crusty costume piece from yesteryear. Compass Rose Buds has you covered -- make your custom tie-die muscle tank for the parade, eat, drink and the proceeds go to charity! 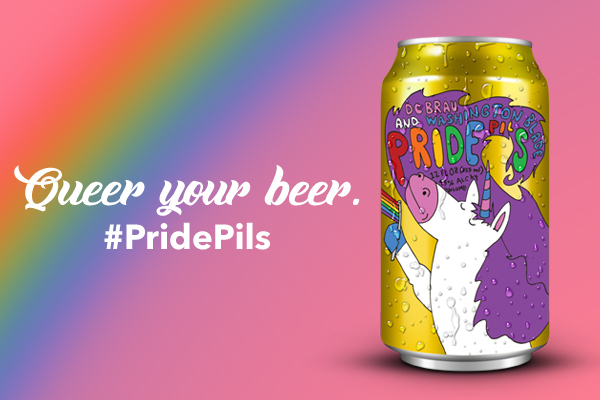 DC Brau + The Washington Blade held a contest to design this incredible Pride Pils -- go to the official launch at Town Patio (no cover but it's cash only). Throw some shade at "Queer Me Out: A New LGBTQ Speaker Series" presented by The W Hotel -- best part it's FREE at POV! Opening Party the Rainbow Resistance presented by BYT & Capital Pride is a must stop throw down. Eat/Drink nearby in Ivy City at lesbian owned Republic Restoratives distillery, Dock FC or La Puerta Verde. Epic DC bottomless brunch spot, Urbana, is taking it to the next level with "Pride & Shine" an all day party located on the parade route with RuPaul's Drag Race star Roxxxy Andrews and DJ Trayze. Similiar to the historic Women's March on Washington, the entire community is mobilizing for the Equality March. Eat and drink options we love nearby the end route in Penn Quarter/Chinatown are Red Apron Butcher, China Chilcano or vegan it up at Hip City Veg. Pride festival and concert staples of Capital Pride include headliner Miley Cyrus and the Pointer Sisters! Eat/Drink nearby the National Mall if you aren't into "festival" food check out Pinea patio at the W or some of the awesome eateries at CityCenter like RareSweets, Fruitive, and Centrolina.